Amp has always been one of my favorite energy drinks and luckily Amp Boost (original) as it’s now called still tastes the same and I assume the ingredients are the same (142mg caffeine per 16oz can). I just really do not like this new can. The light green color just looks weird to me. 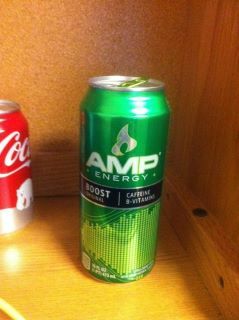 They’ve made the change to differentiate between two new types of Amp as described on the can: Amp Active (Energize and Hydrate) and Amp Focus (Keep you Edge), while Boost is the original Amp (With B-vitamins to help kick you into high gear). I haven’t seen the other two types of Amp yet, but I can’t say they’ll appeal to me. I’ve never been a fan of watered down ‘hydration’ energy drinks, though athletes might be. As for focus, isn’t that what the blue Amp is for? I haven’t seen a change in design on any of the other Amp varieties yet. Ultimately the yellow (lightning I believe) and red are my favorites so for now at least I wont have to look at an ugly new can when I drink those. I’ve been realizing lately just how much of my life lives on this laptop. Music, videos, pictures, documents, all valuable data some of which is unique and might not be able to be recovered should something happen to my laptop. I never worried a lot about losing data when I used a desktop PC because I figured should my PC fail I could always pull the hard drive and install it into a new PC. Of course the hard drive could fail, but most of the times when my computers went up in smoke the hard drives survived. A laptop, however, is a different story. Should this thing fail I wouldn’t know where to begin in an attempt to recover its hard drive and the data stored on it. I’m sure it can be done, but I’m certain it wouldn’t be as easy as it is on a desktop PC. So this has gotten me to ponder whether I should subscribe to an online backup service. The advantages: My data can be backed up in a remote location where it can be recovered should my hardware fail or get stolen. The data should remain there for as long as I need it (and continue to pay the subscription fee) and the data should be secure. If I buy a new laptop I should be able to download all of my data onto it (I continue to use the word ‘should’ because I can’t say I’m 100% sure on how all this works and how reliable these services are). My important and valuable data will be backed up automatically without me having to put forth any effort. This will lead to peace of mind as I’ll know that if something were to go wrong I wont one day have a sick feeling in my stomach as I realize all of the data I’ve lost permanently. Music can mostly be downloaded again (especially with iCloud) and most of my pictures exist in various locations across the web (Facebook, Instagram, Flickr) but trying to gather all of this might prove challenging. I might be able to get most of it back, but what about the stuff I don’t even know I have now? I’m sure there’s some long forgotten pictures, videos or files of some sort lost somewhere on my laptop that I haven’t seen in years. I might not miss it now, but maybe some day I’d really wish I had these files. I must apologize for the random spewing of thoughts above. I’m tired and opened this box and just started typing. Anyway, I’m going to be setting up Carbonite to give it a 15 day trial and might consider purchasing the $59/yr plan (which offers unlimited storage space, there are more expensive plans with more extensive benefits). I’m not sure what I’ll learn from this trial as I hope my laptop doesn’t fail in the next 15 days causing me to need to recover all of my files, but if the software is easy to use and efficient I’ll probably end up subscribing so I can stop worrying about having to one day try to rebuild my entire digital life. While browsing the iTunes store late last night I saw an album cover that caught my eye. I gave the album a quick listen and instantly knew I had to purchase it. 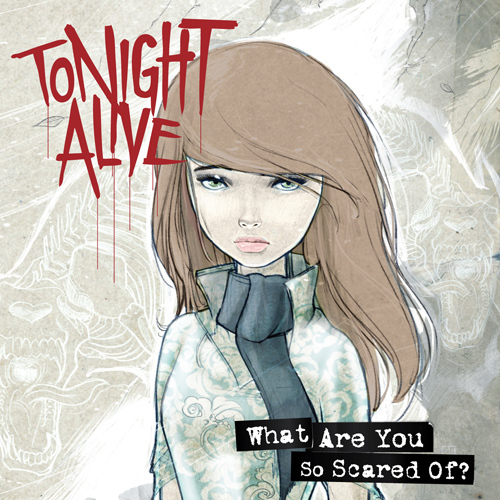 I picked up the deluxe edition of Tonight Alive’s “What Are You So Scared Of” for just $10.99 (only $1 more than the regular edition). The deluxe edition includes two music videos, “Breaking and Entering” and “Starlight” alongside the album. Tonight Alive was formed in 2008 in Australia and originally released an EP only in Australia and Japan before signing to Fearless records and re-releasing their EP. Their first LP “What Are You So Scared Of” went on sale today. The band is lead by vocalist Jenna McDougall and has an upbeat pop / punk sound. Jenna’s vocals are powerful and confident over strong and peppy guitars and drums. Stand out tracks include “Starlight” and “Let it Land” on which McDougall’s emotions seep out but her strong voice never fails. Blink 182’s Mark Hoppus contributes vocals for a verse on “Thank You and Goodnight” and my only complaint is that his verse is too short. I’m sure the up and coming band was thrilled to work with an icon of the genre. I definitely recommend you give the album a listen, whether you a fan of female vocalist bands or not. I’d be willing to bet Tonight Alive might just change your opinion. So tomorrow is Valentine’s Day and if you’re looking for a movie to watch to get in the romantic mood I thought I’d share two of my favorites. First is (500) Days of Summer. This film is one of my favorites in any genre, but it tells a really good love story…sort of. In reality (500) Days of Summer is about two people falling in love and then out of love and the period after this relationship, all taking place within 500 days. The story is sad, but ultimately the film ends on a happy and uplifting note. Second is Happy Thank You More Please. This movie has a great indie fill with a soundtrack of “hip” indie sounding music that is hard not to love. The film, in my opinion, is simply about life with an emphasis on love and happiness. It tells the stories of several different people and focuses on love, friendship and the importance of a positive attitude. I’d also like to add Juno and Nick and Norah’s Infinite Playlist for good measure. That is all 🙂 Happy Valentine’s Day eve. Today I was browsing ArsTechnica in class and came across two articles that I found interesting. Today, especially on the mobile gaming market, it’s easy to come across a large quantity of copy-cat or clone games. These games take the idea, design and gameplay of a popular game, tweak it (barely) and spit it back out as their own product in order to make a quick buck. The article gives two specific examples. The first is the original and addicting game Tiny Tower by NimbleBit which was practically stolen outright and repackaged as Zynga’s Dream Heights (the article features great side by side comparison screenshots). The second game is Bingo Blitz which was also seemingly photocopied and released as Zynga Bingo. The indie developers are fighting back against Zynga with creative ‘dear Zynga’ letters: Tiny Tower letter Bingo Blitz letter. This sort of plagiarism shows not only the greed of larger companies like Zynga, but also that they’re willing to forego creativity to make some quick cash. These acts take away sales from the smaller developers who put in all the hard work to come up with an original idea in the first place. The second article, “Game Publishers. Huh? Good God ya’ll what are they good for?” also by Kyle Orland briefly describes the role video game publishers have played in history. It explains the importance of a publisher, what they do (in a nutshell) and how their roles are changing in the modern age of gaming. It’s definitely a good read, especially if you’ve ever found yourself wondering what exactly the difference is between a video game developer (such as Bungie, Blizzard, or Infinity Ward) and a publisher (such as Microsoft Game Studios, Electronic Arts or Activision-Blizzard). The closest thing to Mario Kart on the 360 is…? So yesterday I played soccer in Forza 4 for the first time and it was a blast. A bunch of nice looking cars (with teams identified by blue or red paint) zoom back and forth on a concrete soccer pitch trying to knock an oversized soccer ball into the opposing teams goal. There were plenty of crashes and massive pileups as everyone frantically raced toward the ball. It wasn’t so much about skill, but rather it was about good old beat each other up fun. Playing this got me in the mood for more vehicular mayhem. I was wondering if anyone can recommend a good multiplayer car / vehicle game that is more about fun and mayhem than skill (possibly with a variety of mini games and objectives). I’ve played both Blur and Split / Second but neither really did it for me. I haven’t played a Burnout game since the original but I never really liked it then anyway. I guess what I’m really looking for is Mario Kart, so does the 360 have an equivalent with a fun, easy to pick up chaotic experience? There are a ton of these videos available for your viewing pleasure. I still have yet to watch them all and am sure to discover some new favorites. I hope you’ll give these videos a shot, and I hope you enjoy the series as much as I have.